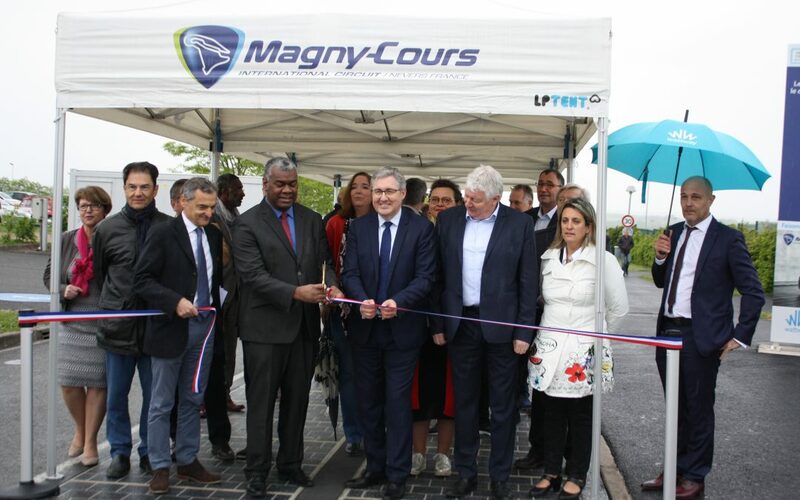 THE INAUGURATION OF THE ROAD OF THE FUTURE, THE WATTWAY! The Chairman of the Board of the Circuit, Serge Saulnier, the President of the Conseil Départemental, Alain Lassus, the Director of Global Public Affairs for Group Colas, Pascal Tebibel, and the Prefect of the Nièvre, Joël Mathurin, arrived at 11: 00 on Saturday, April 28 2018 to inaugurate the 50 m² of solar road surface at the entrance of the circuit. This project is the result of a close collaboration between WattWay Group Colas, the services of the Conseil Départemental of the Nièvre and the Circuit of Nevers Magny-Cours. The Road of the Future showcases French innovative progress as the Circuit of Nevers Magny-Cours is the first motor racing circuit to be equipped with a portion of this Road of the Future. A display board shows the immediate electrical power (in W), the daily and cumulative production since the road was commissioned (in kWh) and the equivalent of kilometres travelled in an electric vehicle. The power consumption of one-sixth of the conference centre will be produced, thanks to this 50 m² of solar road.